As soon as it rolled round to April fools day I declared on Twitter that I hate April fools day because you can't believe anything you read until we're safely into the second day of the month. However when I was scrolling through my Twitter feed on April 1st I realised that actually it's a really good opportunity for brands to have some fun coming up with a 'new product' to try and fool us with. For something a little bit different I thought I'd do a post on a few of my favourite April fools from the beauty brands. My Twitter didn't go back far enough to show the whole mornings tweets (lets just pretend I didn't get up at nearly midday!) so there's probably loads I missed, but these were a few of my favourites. The first April fool I encountered was from The Body Shop when I opened an email from them saying they were releasing a new body butter called Shroomactive. As I'd just woken up and checking my email was the first thing I'd done I actually fell for this to begin with until I suddenly realised it was April fools day. Clicking the link actually took you to a fake product page on the website which told you about how it reacts to the hormones you secrete to release the appropriate fragrance for your mood. It even warns you that this doesn't contain Psilocybin, which is the chemical in magic mushrooms that makes them trippy! I told The Body Shop I was actually quite disappointed this wasn't real because the packaging is so pretty. I love the metallic blue coloured tub! Although this obviously isn't a real product Barry M did come up with this in conjunction with breast cancer awareness charity CoppaFeel, so this was also helping a very worthy cause. 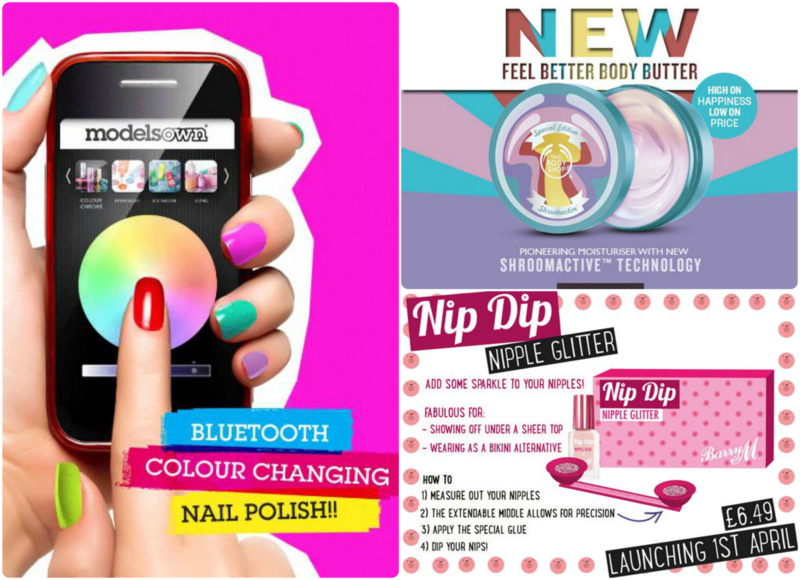 Models Own made a colour changing GIF to advertise their new product Bluetooth colour changing nail varnish! I think the idea behind this is that you use a special top coat and then use an app on your phone to change the colour of your nails instantly. How amazing would this product actually be? No more faffing around removing your old nail varnish, applying a new colour and waiting for it to dry! I think April fools day would be the perfect opportunity for brands to actually launch a new product that is different to the products they already sell, maybe like a nail varnish brand launching makeup products, just to mess with peoples heads a little! Are there any good April fools I missed? Which one was your favourite?